X is the number of players in the game. Orc and Creature enemies get -30 engagement cost and +1 Threat. 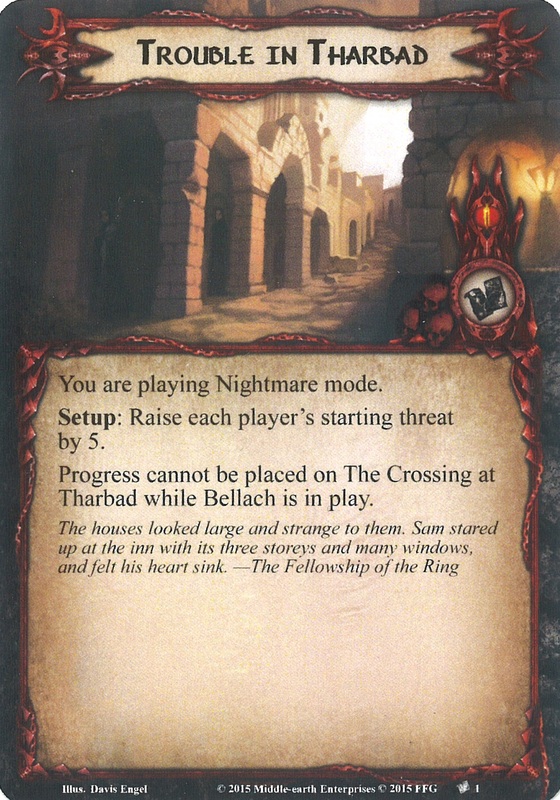 Forced: When Bellach is destroyed, shuffle him into the encounter deck. X is the number of cards underneath The Orcs' Search. 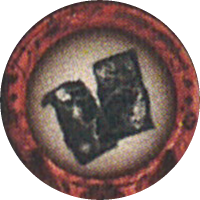 Scour: Each player must search the encounter deck and discard pile for an Orc enemy and add it to the staging area. While Bellach's Marauder is engaged with a player, it gains: "Forced: After a time counter is removed from the current quest, deal Bellach's Marauder 2 shadow cards." Shadow: Remove 1 time counter from the current quest. While a player controls 5 or more allies, Bellach's Hunter gets -20 engagement cost. Forced: When Bellach's Hunter engages a player, that player must either remove all time counters from the current quest or deal 5 damage to a hero he controls. Bellach cannot take damage. Scour: Heal all damage from Bellach's Bodyguard. Shadow: Attacking enemy cannot take damage until the end of the phase. When Revealed: Either place 3 damage on the active location, or reveal an additional encounter card. Scour: Place 1 damage on the active location. Shadow: Place 1 damage on the active location. 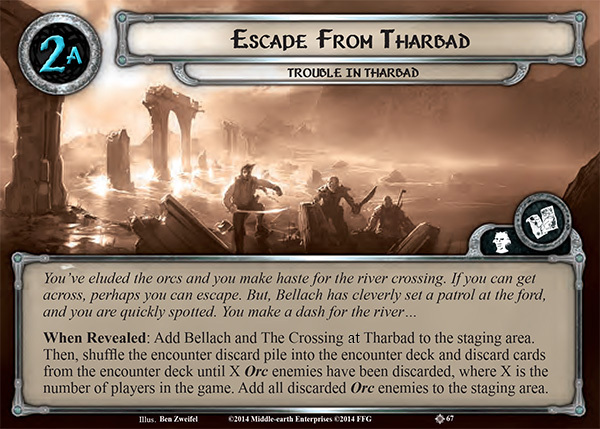 When Revealed: Add Bellach and The Crossing at Tharbad to the staging area. Then shuffle the encounter discard discard pile into the encounter deck and discard cards from the encounter deck until X Orc enemies have been discarded, where X is the number of players in the game. Add all discarded Orc enemies to the staging area. Time 3. 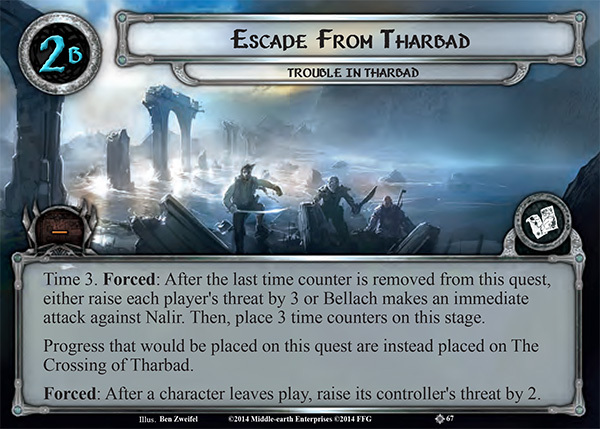 Forced: After the last time counter is removed from the quest, either raise each player's threat by 3 or Bellach makes an immediate attack against Nalir. Then, place 3 time counters on this stage. Progress that would be placed on this quest are instead placed on The Crossing at Tharbad. Forced: After a character leaves play, raise its controller's threat by 2. When Revealed: Trigger each Scour effect currently in play. Bellach makes an attack against the player who controls Celebrimbor's Mould. Then, attach Celebrimbor's Mould to Bellach. Forced: After the last time counter is removed from this stage, trigger each scour effect currently in play. Place 3 time counters on this stage. Unless there is at last 12 progress on this stage, Bellach is immune to player card effects and cannot be engaged.The players cannot win unless Celebrimbor's Mould is attached to a hero. If the players defeat this stage, they win the game. 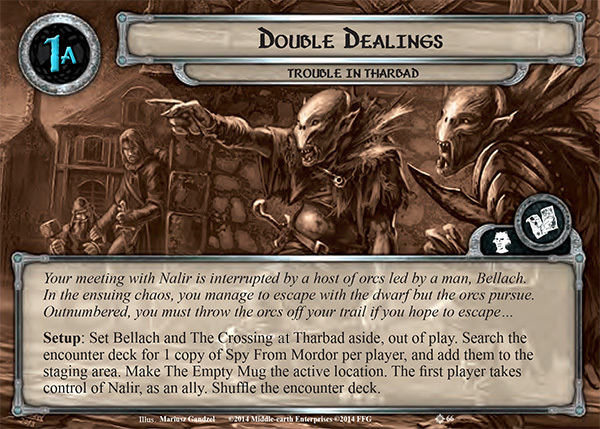 Setup: Set Bellach and The Crossing at Tharbad aside, out of play. Search the encounter deck for 1 copy of Spy From Mordor per player, and add them to the staging area. Make The Empty Mug the active location. The first player takes control of Nalir, as an ally. Shuffle the encounter deck. Time 4. Forced: After the last time counter is removed from this quest, reduce each player's threat elmination level by 10 for the remainder of the game. Then, place 4 time counters on this stage. Forced: After one or more progress is placed on this quest, cancell all progress and reduce each players threat by an equal amount. When all players have 0 threat, immediately proceed to stage 2. Setup: Add Bellach, The Orcs' Search, and The Secret Chamber to the staging area. Attach Celebrimbor's Mould to The Secret Chamber. Each player adds a different Ost-in-Edhil location to the staging area. Shuffle the encounter deck. Forced: After the last time counter is removed from this stage, trigger each Scour effect currently in play. Place 3 time counters on this stage. Ballach is immune to player card effects and cannot be engaged. The players cannot advance unless Celebrimbor's Mould is attached to a hero. You are playing Nightmare mode. Setup: Raise each player's starting threat by 5. Progress cannot be placed on Crossing at Tharbad while Bellach is in play. Begin with the standard quest deck and encounter deck for Trouble in Tharbad scenario. 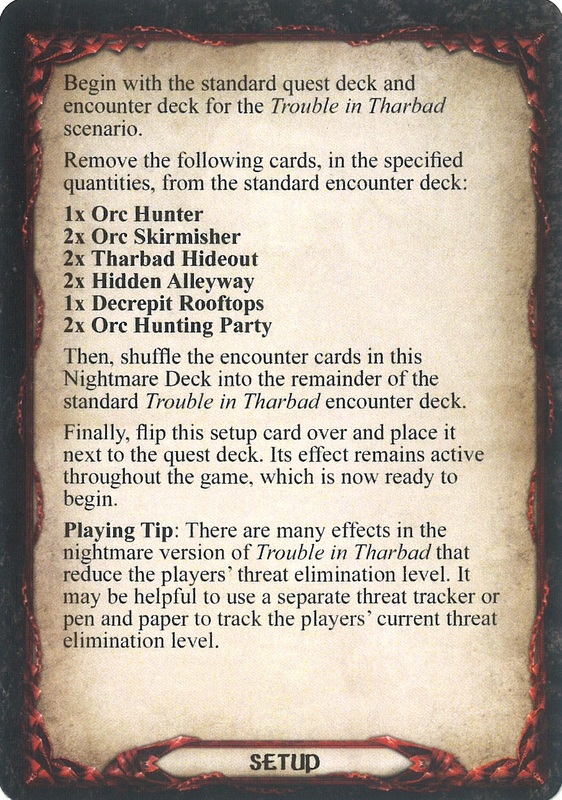 Remove the following cards, in the specified quantities, from the standard encounter deck: 1x Orc Hunter 2x Orc Skirmisher 2x Tharbad Hideout 2x Hidden Alleyway 1x Decrepit Rooftops 2x Orc Hunting Party Then, shuffle the encounter cards in this Nightmare Deck into the remainder of the standard Trouble in Tharbad encounter deck. Finally, flip this setup card over and place it next to the quest deck. Its effects remain active throughout the game, which is now ready to begin. When Revealed: Bellach makes an immediate attack against each player in turn order. Then, deal 1 damage to the active location for each character destroyed by this effect.